Sentences range between 4 and 12 years in jail, plus probation. Redemptorists celebrate Mass for the prisoners. US State Department complains the accused simply exercised their right to free speech. Human Rights Watch protests, calls on the authorities to listen to the people and to its critics. Ho Chi Minh City (AsiaNews) - A court in Ho Chi Minh City sentenced three Vietnamese bloggers, Nguyễn Văn Hải (Blogger Điếu Cày), Maria Tạ Phong Tần and Phan Thanh hải (blogger anh Ba Sài Gòn), to 4 to 12 years in prison, plus probation, for "propaganda against the Socialist Republic of Vietnam". On a cold and rainy morning, police arrested and took away relatives of the accused who tried to attend the trial. 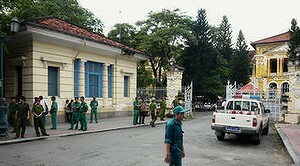 Some 400 officers from the police and the secret services patrolled the streets leading to the courthouse (pictured). The three were arrested and convicted on baseless charges. In fact, if the law has been violated, it is by the authorities. International organisations like Human Rights Watch slammed the court decision. "We are deeply troubled by the convictions of three Vietnamese bloggers who appear to have done nothing more than exercise their right to freedom of expression," said State department spokeswoman Victoria Nuland. On Sunday, the Redemptorists heeded a request by the bloggers' relatives for a Mass to pray for them and 17 other Catholics unfairly jailed. Some 2,000 people attended the service, including non-Catholics. "It was certain that the three faced heavy prison sentences," said Fr Joseph, "that they would 'lose' in the trial; however, their work was meaningful. They are brave patriots in a society of unjust behaviours. We prayed especially for new Catholic bloggers." The convictions are based on Article 88 of the Criminal Code, an infamous legal tool used to arrest and incriminate people arbitrarily. For this trouble, Nguyễn Văn Hải was given 12 years in prison, and five years of probation. Maria Tạ Phong Tần, who was baptised by the Redemptorists in 2009, received a nine-year sentenced, plus five years probation. Phan Thanh Hải was given four years in prison and three on probation. For some, this is a harsh and unfair sentence. It allows us to understand the direction the government is taking. Human Rights Watch called on the government to release the prisoners immediately. The government needs to understand the nature of social issues and phenomena and should listen to people's opinions, even their criticism. If the bloggers are gagged, or imprisoned, the country's current problems and difficulties cannot be solved.